To which her reply was unquestionable, non-Mother-adoring, silence. Anyway, it’s not that I feel the need to meet every whimsical expectation of my eldest child — but making marshmallows was something I had been meaning to try and do, so this week it was. But my 3-year old has been down with a fever and headache since Monday morning — and when I woke with her beside me in bed this morning, my husband informed me that our eldest was the latest to succumb. So we’re home today, all three feeling tired and cranky, and I’m trying to simply be thankful for the relatively healthy year we’ve had, rather than feel inconvenienced or grumpy. Because, I mean, marshmallows. On my to-do list, on a Wednesday. Instead, I’m whipping up what can best be described as the opposite-end-of-the-spectrum: homemade Gatorade. I’ve got two pitiful little ones, neither one having much of an appetite. I want them to stay hydrated, and keep balanced electrolytes. But I also want them to avoid sugar at all costs, since that ingredient effectively shuts down the immune system. Enter homemade Gatorade: all-natural, no refined sugar, no chemicals, tastes just like the powdered stuff. 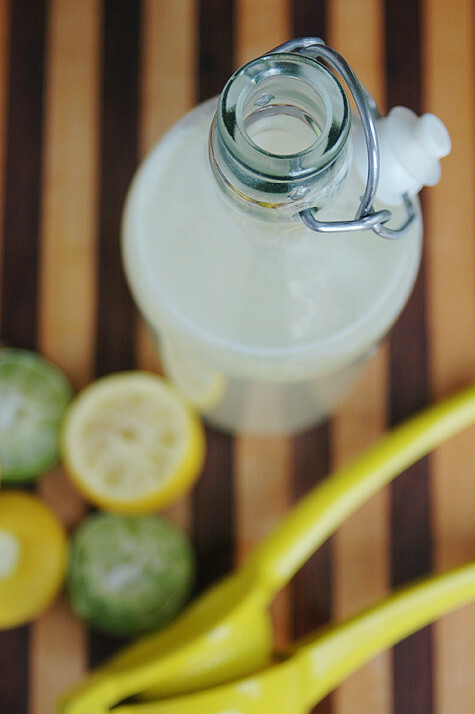 If you happen to have a couple lemons or limes & some honey, you’ve got all you need. Confession: I don’t think my youngest has ever had Gatorade, and my oldest has likely only had it at soccer practice. So while they don’t care that the flavor is so similar, they both drank it up, guaranteeing that they’ve ingested fluid, salt, and calcium. That’s a win. And the marshmallows? Let’s just say that’ll be the barometer for how we’ve fared, come my next post. Combine juice, honey, salt, and optional calcium in a quart-sized (32-oz) jar with a tight-fitting lid. Add enough water to make 1 quart. Shake well, enjoy. Store leftovers in the refrigerator. Copyright © Katy Carter, 2011. Hi! I love this idea! Does the citrus help dissolve the honey, or would it be better to heat it if time permits? Thanks for the great recipe. I really miss you! Not sure if it’s the citrus, but I used cool water straight from my fridge, and after shaking, the honey was completely dissolved. Aw, I hope everyone feels better soon!! I love the idea of this, I think I’ll save this to try in the warmer months. My hubby works outside in the summer and likes to take his own drinks instead of buying anything so this would be perfect. What a fabulous idea! And hats off to you for limiting your kid’s sugar intake. I always shudder when I see people buying Gatorade by the case for their kids. I tend to reach for the coconut water when I need to increase my hydration/electrolytes, but I love the idea of adding some Vitamin C and calcium to the mix! I will definitely be giving this a try! Alan, you could certainly experiment! Cinnamon is a good treatment for colds, so it makes sense that it would work in a drink used to rehydrate after sickness. My only question would be whether it will combine well with the liquid — I’m thinking of the times I’ve tried to sprinkle cinnamon over a coffee drink, and it tends to sit on the top. But the shaking might take care of that. Do you consider this an “only when sick” beverage, or something a person could drink often? I’d really like to find something to satisfy my sweet toothe that isn’t a Coke or candy — you KNOW how I am about sweets. If there is no “extra-bad” associated with this recipe, it sounds like something I could keep at work with me — would keep me off the Life Savers and away from the snack machine. No, you could totally use this as a soda substitute. Also good as a summertime lawn-work refresher. Wow, thanks for sharing. I’ve got two little sick ones at home now. I actually have these ingredients, including the calcium tablet, so I am going to give this one a try. Lisa, hope you enjoy, and that your little ones recover soon! Where can you buy dolomite powder and calcium tablets? Tara, I bought dolomite powder at my local health food store — it’s a calcium supplement (one tsp provides the calcium of a quart of cow’s milk — it’s used a lot in making homemade dairy alternatives). Calcium tablets could be purchased at your local drug store, though if you can get a brand that is just calcium with no other additives. great idea — I love epsom salts! Had my oldest take an epsom salt detox bath when she was feeling her worst last week. And LOVE the orange idea — that’s what I’ll try in my next batch — thanks for your comments! It looks tasty, but it’s not limiting sugar intake–it’s actually almost doubling it! The 1/3 cup honey you’re adding has 90-100 grams of sugar in it. A quart of commercial Gatorade (bought whole or made from powder) has 56g of sugar. GSH, 1/3 cup honey does have about 90 grams sugar. I’d rather my kids have 90 grams of sugar from raw, local honey than 56 grams of processed white sugar (white sugar is what is so offensive to the immune system — and in fact raw honey has been shown to naturally help the fight against a cold). Not to mention skipping out on the artificial flavors and colors of Gatorade. It’s a no-brainer in my house. That’s entirely reasonable. I was just concerned by all the comments saying it was lower in sugar; it’s not, and implying otherwise could be dangerous to someone who’s diabetic or otherwise medically interested in regulating sugar intake (or for someone cutting calories). But for an otherwise healthy person, it’s entirely reasonable to weigh that concern against things like concerns over refined sugars, artificial ingredients, etc.